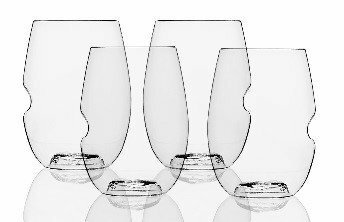 The Govino Go Anywhere Wine Glass Performs Better Than Plastic, Acrylic, Silicone And Polycarbonate Glassware Or Red Solo Cups, Making Govino The Ideal Choice For Your Travel & Drinkware Needs. Designed For Fine Wine, Govino Glasses Also Serve As A Great Spirits, Liquor, Cocktail, Whiskey, Port, Beer Glass. The Award Winning Govino Wineglass Is Actually Not Made From Glass At All. It Is Made From A Food Safe, BPA-Free Polymer Which Reflects A Wine's Color And Aromatics Much Like Crystal. Each Tote Comes With A Set Of Four Crystal-Clear Shatterproof "Glasses" That Are As At Home At A Picnic Or Party As They Are Poolside, Polo Club, Port-Side Or Even A La Playa. If you have any questions about this product by Govino, contact us by completing and submitting the form below. If you are looking for a specif part number, please include it with your message.